A new healthcare electronic funds transfer (EFT) standard went into effect at the beginning of 2014, and many healthcare professionals are reaping the benefits of the time and money savings it can provide. In the past, the lack of an EFT standard placed a heavy burden on providers. Providers interested in receiving EFT payments had to deal with a variety of enrollment procedures, and transactions were often delayed. There was also no standard for reassociation of data, making it difficult to match payments with claims payments. As part of the Affordable Care Act, the new healthcare EFT standard, NACHA's "ACH CCD+ Addenda," took effect in January 2014 to help remedy those burdens. For healthcare professionals, the new standard offers a faster, easier, and less expensive way to handle payments. For example, each EFT payment includes a reassociation number, which makes matching outstanding claims with payments quick and easy for accounting offices. 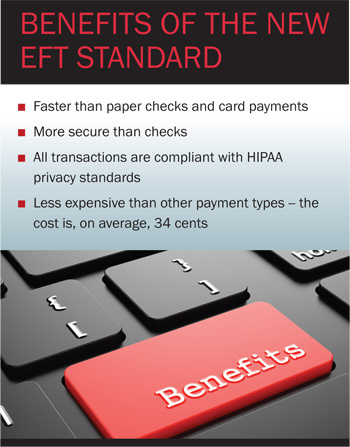 The healthcare EFT standard is the only payment method with this feature. Healthcare EFTs via automated clearinghouse (ACH) are also faster than paper checks and card payments. Healthcare EFTs are received as quickly as funds deposited directly into your bank account, and the transferred funds are available up to seven days faster than paper checks. Additionally, healthcare EFTs via ACH are more secure than checks – the dominant payment form targeted by fraudsters – and all transactions are compliant with HIPAA privacy standards. Overall, the cost reductions and improved efficiencies afforded by the new healthcare EFT standards could save physician practices and hospitals up to $4.5 billion over the next 10 years, according to preliminary estimates from the Department of Health and Human Services. Like Performance Pediatrics, other healthcare practices can easily begin realizing the benefits of the new healthcare EFT standard. To get started, providers must contact their health plans, choose the healthcare EFT standard, and provide the health plans with their payment information. All health plans, as well as third-party administrators (TPAs) that represent health plans, must be able to deliver the EFT standard if requested by a provider. Health plans are not allowed to delay or reject an EFT or ERA transaction. The Centers for Medicare & Medicaid Services (CMS) in FAQ 9778 states that a health plan may not charge excessive fees or otherwise give providers incentives to use a payment method other than the ACH Network. 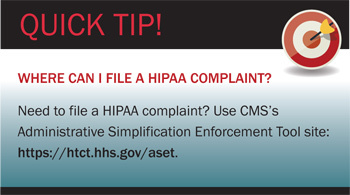 If a health plan is unable or refuses to comply with a provider's request for EFT payment via ACH, the provider should file a HIPAA rules violation on the health plan. If a TPA is noncompliant, the provider should first report the TPA to the health plan's compliance provider. If the situation is still not resolved, the provider should then file a HIPAA rules violation on the health plan, which is responsible for ensuring its third-party representatives comply with all regulations. For more information on the new healthcare EFT standard, visit healthcare.nacha.org. Priscilla Holland, AAP, is senior director of healthcare payments at NACHA – The Electronic Payments Association. 1 NACHA Case Study, Small Provider Practice, https://healthcare. nacha.org/sites/healthcare.nacha.org/files/files/003_CSG_Nacha_Pediatrics_CaseStudy_OUT.pdf. 2 The Blue Book of Bank Prices, Phoenix-Hecht, 2012-13. 3 2013 US Healthcare Efficiency Index, last revised May 5, 2014, www.caqh.org/pdf/2013Index.pdf. 4 Federal Register, August 10, 2012, Vol. 77, No. 155, http://www.gpo.gov/fdsys/pkg/FR-2012-08-10/pdf/2012-19557.pdf.